After inviting friends and family over for a special occasion, no task can be more daunting than having to clean all of your dishes, especially glassware. Whether it’s tumblers, beer mugs or your best crystal, each style seems to have its own set of rules – especially when it comes to wine glasses. Some are dishwasher safe and some are not. Many have narrow necks, making them a challenge to keep spotless and residue-free. And if you decant your wine, cleaning the odd-shaped vessel is a formidable task all by itself. 1. If the wine glasses you use are dishwasher safe, clean them separately from all plates, knives, forks, spoons and any other tableware. With their own wash, you’ll prevent tiny food particles from sticking to the glass. And set it to the shortest possible cycle without adding detergent. The use of cleansers will leave both residue and a small odor impacting the wine’s taste over time. 2. Place the bowl of the glass upside down so that it doesn’t collect any water during the rinse cycle. Once completed, open the door of the dishwasher to let out all of the humidity, which can tarnish your glasses over time. 3. Dry each glass with a lint-free linen cloth. Letting them drip-dry will smear it with water spots. 4. First, fill your sink with warm water and apply soap to a lint-free cloth to wash. Rinse each glass under lukewarm water and smell the bowl after to make sure all the detergent has been removed. 5. If you want to take it one step further and make your glasses shine like they’re in a TV commercial, try steaming them by placing the glass over a pot of boiling water before drying. 6. When drying a wine glass, never hold it by the stem. Doing so cannot only break the glass but also severely cut your hand. Instead, hold it by the bowl and use a wooden spoon wrapped in a linen cloth to clean the bottom as needed. Forcing the cloth to the bottom by hand can break the glass as well. 7. After rinsing it out with warm water, wrap a damp linen cloth around a nylon rope and feed it inside the decanter to clean out the bottom. For drying, make sure the cloth you use is also arid. 8. To remove those stubborn stains, place copper balls or lead shots into the decanter and shake them around. 9. Avoid storing your wine glasses in cardboard boxes or inside closed cupboards. Glasses can absorb all sorts of smells that alters the taste of the wine so keep them upright and on an open shelf or rack so air can circulate around them. 10. If you think your glasses have picked up any odors, either rinse them in cold water or pass them through the air quickly several times. 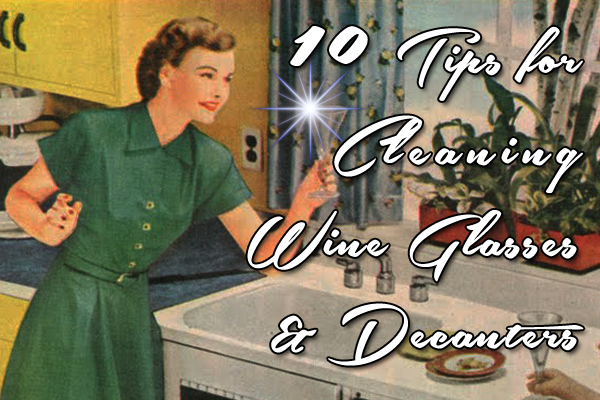 How do you clean your wine glasses? Lead shot? Copper? Really? How about stainless steel balls?